Three major Cardiff employers have received Credit Unions of Wales Awards for helping to improve the financial health of their workforce. Cardiff Council, Cardiff Bus and the Cardiff-based offices of Legal & General were honoured for supporting the welfare of their staff by encouraging them to access a range of affordable financial services from their local credit union. 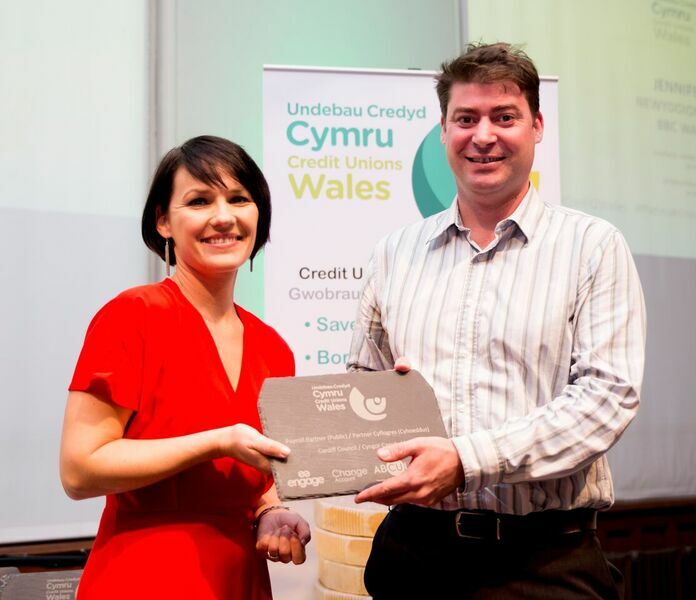 All three companies received their awards from BBC broadcaster Jennifer Jones at a ceremony in The Pierhead, Cardiff Bay on International Credit Union Day. Cardiff Council won the Payroll Partner (Public) Award, Cardiff Bus received the Payroll Partner (Third Sector) Award and Legal & General were highly commended in the Payroll Partner (Private) category. Cardiff & Vale Credit Union Chief Executive Leanne Herberg said: “We are so pleased to see our partners in Cardiff getting the recognition they deserve for being leaders in financial wellbeing in the workplace. By entering into a partnership with Cardiff & Vale Credit Union all three of the winning employers offer payroll schemes to staff which allows them to save and access affordable loans directly from their salaries into a credit union account. Cardiff & Vale Credit Union now has 40 payroll employer partners, with over half of their 9,000 members using a payroll scheme with their employer to benefit from their services. Jane Hutt AM, Patron of the Credit Unions of Wales also attended the event and launched a campaign for Welsh people to take a stand against high cost credit providers.